Elevate into peace after a long day with our Ceramic Waterfall Backflow Incense Burners. Incense has been used traditionally for centuries in a variety of meditation practices to calm the state of mind. The aroma of the incense is said to uplift the spirit and with some even purifying the air and boosting your immunity. Our waterfall backflow incense burner will help you create a tranquil atmosphere wherever you want! The mesmerizing smoke falls downwards creating a relaxing waterfall effect. Pair this with our Waterfall Backflow Incense Burner for Good feels and vibes all day long. This is the perfect gift for those who enjoy peace and tranquility. Makes a perfect ornament piece for your spa, home, or office. Who do you know would love this? 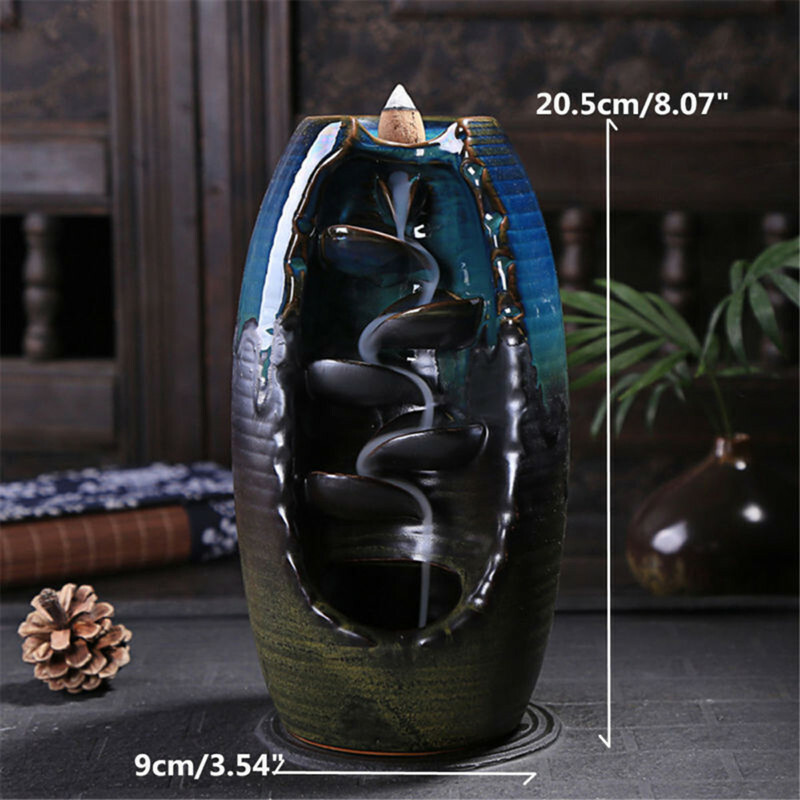 Creative Design: Creative ceramic reverse-flow incense burner, left and right blade interleaving design, not only breaking a single feeling but also making smoke, connecting left and right, increasing the sense of hierarchy. Delicate Appearance: Small and delicate, exquisite design and modeling, suitable for decoration. Use on Many Occasions: It can be used to incense in the living room when visitors come to visit it, it can create a comfortable atmosphere and purify the air. Office incense, purifying the air while reducing mental depression. Bedroom incense, eliminate fatigue, improve sleep quality. Study incense, let a person loosen, eliminate miscellaneous thoughts. Efficacy: Fresh air, calm the nerves, help focus, decoration, etc. Size: 10.5 x 20 cm / 4.1" x 7.9"
LOVE IT! Very exotic-looking, and the effect from the incense cones where the smoke trickles out of the dragon's mouth is amazing! You have to get the 'backflow' incense cones though - not all cones will create this effect. Nice incense stick holder as well. I really like it. I like that it has the option to use the stick incense with it as well and the holes are a very nice size. The designs on it are very pretty as well. The cone incense that comes with it don't have much of a fragranced smell, so I used one of my stick incense with it, and it gets the job done. I am so happy to have it as a part of my collection. Absolutely gorgeous! And works perfect, the smoke goes down every leaf and into the bottom. Mesmerizing to watch. Came with a mixed bag of back flow cones. It's great to watch the smoke flow down like milky water. But, any breeze at all and it needs to start all over as the smoke is blown away from the burner. Still, fun to watch, made well.